If you have recently welcomed a new puppy into your home please accept our congratulations.We recognise that getting things right throughout their growth is vital as this is one of the most intense and important stages in your new arrival’s life. We want to support both you and your puppy as best we can throughout this rapidly changing period. Choose a collar size appropriate to your puppy, and don’t forget that you’ll need to regularly alter its fit as they grow! Choose a variety of toys to help your puppy express their natural play behaviours. Consider that different puppies might enjoy different types of play. Giving your dog a safe, quiet, comfortable space of their own to sleep and rest will help them settle in and will help with training. Your puppy will need to be safely restrained while out and about in the car. Your pet retailer team will be able to give you plenty of advice on choosing everything you need to look after your new arrival. Your breeder will be able to let you know your puppy’s daily ration, call our nutritional helpline or follow the feeding guideline on the bag. Learn how to read our feeding guidelines here. Lots of sleep, without being disturbed. Choose a bed that is comfortable, easy to clean and strong and place it in a quiet area. A clean supply of fresh water available at all times. Regular, frequent meals of puppy food in the same place and at the same times each day to help establish a structure. When it comes to food, it is a good idea to stick to your new puppy’s existing routine as much as possible for the first few days. It is a good idea to ask the breeder to supply you with a small amount of your companions’ current diet. Once those first few days are over and your companion is settled, you can start to introduce a ROYAL CANIN® diet (one designed for growth) very gradually, over 5-7 days, if you want to switch. Once your puppy has made the change, follow the feeding guides on the pack closely, as these will differ month by month as your puppy grows. Most puppies initially need at least 3 or 4 meals per day but the meal frequency can usually be reduced to 2 or 3 meals per day as they grow. During the first few weeks, allow your new arrival a few days of quiet rest to help ease settling in. Then offer gentle play, keeping play times short, with appropriate toys, used under supervision. Ensure there is no confusion and only allow and reward play behaviour that you will continue to encourage as your puppy grows up. Ignore any inappropriate behaviour, even if it seems endearing in a young animal e.g. jumping up, climbing on furniture, mouthing and scratching. We all want a happy, friendly and confident pet, but many owners don’t realise that it is what their puppy experiences at an early age that is most important for this. The period known as the ‘socialisation window’, is the time during which your puppy is much more accepting of any new situations and encounters. The more they experience during that time, the more they will be comfortable with as an adult. However, for an emotionally well-balanced companion, the best thing is to continue with ongoing socialisation opportunities throughout their life. Regular, short periods of exercise are an essential part of your puppy’s routine. Be careful about taking your puppy out or letting them meet other dogs until they have had their vaccinations – your vet will be able to let you know what is safe. Do remember though that early socialisation is important.ge. It’s a good idea for your pet to have a check-up when they first come to live with you so that your vet can make sure they’re healthy, arrange for necessary vaccinations and advise you on other recommendations. Regular vet checks help to keep your companion healthy as they grow and ensure that they get used to going to the vets. Please text the word PUPPY or KITTEN and your breeder ID number to 60777. Texts will be charged at your network rate. We do not make an additional charge. Please have available, the breeders ID number and also the food product that they have recommended for your new pet. This information should be written on the pop out part of the card you were given. If the breeder has not made a recommendation yet, please ask them for that information before sending your text. We will also ask you for details of your pet and yourself. Please contact your breeder to obtain this information before sending your text. Yes, we can provide welcome boxes for up to 5 new pets in any household. If they are from the same breeder and being registered together, you only need send one text and our outbound team will collect the details of each pet. We will make the first attempt to call you within 48 hours of receiving your text. This includes working days only and does not include weekends or public holidays. If you received a confirmation text from us, our outbound calling team will make 4 attempts to contact you. If they are not successful after the 4 attempt they will leave a voicemail asking you to re-text. If you did not receive a confirmation text from us, we did not receive your text. 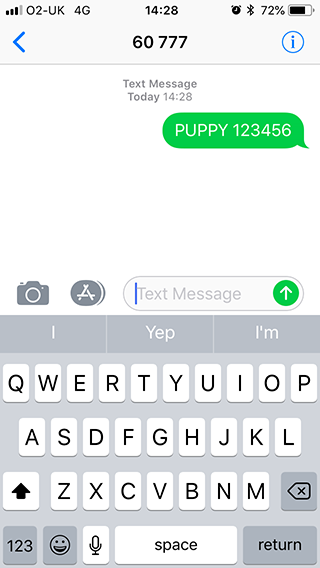 Please check your text to see whether you did include the word PUPPY or KITTEN, followed by the breeder’s ID number. If not, please resend with this information. Unfortunately, some mobile providers prevent their subscribers from texting to promotional numbers. Please call our office or send a message via our Contact Us link. You will need to let us know the breeder ID number and whether you have a puppy or a kitten when you call. between 08:30 and 21:00. You will be called 4 times on different days and at different times. After the 4th attempt you will be left a voicemail with instructions on what to do next. Unfortunately not, this is an outbound calling service and at present we are unable to accept incoming calls. After the 4th attempt you will be left a voicemail with instructions on what to do next. A signature is required for delivery of our boxes, so you may have missed a delivery attempt. Both Royal Mail and Fedex should leave a card for you with instructions on how to re-arrange the delivery. The Royal Mail delivery service that we use can take up to 5 working days, however at times deliveries can be disrupted due to weather or other reasons. We are unable to track this service and we ask you to allow one or two more days beyond the estimated delivery date before contacting us. Our Fedex delivery is a 1-2 day tracked service. You will have arranged a date for a follow up call during your conversation with our outbound caller. During the follow up call, we will ask if your box has been received, if it hasn’t please let the caller know and we will investigate. We would love to see pictures of your new pet with their welcome box, please feel free to share them on Social Media, follow us and tag us. Facebook.com/RoyalCaninUK, Twitter.com/royalcaninuk and Instagram.com.